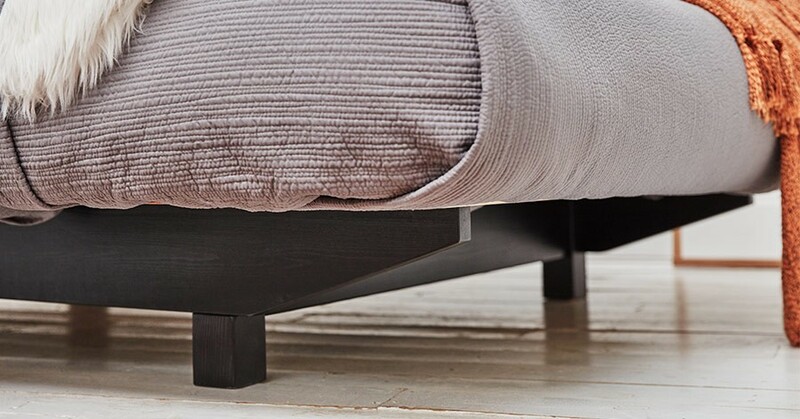 The handmade Floating Bed frame is one of the four in our floating bed range. 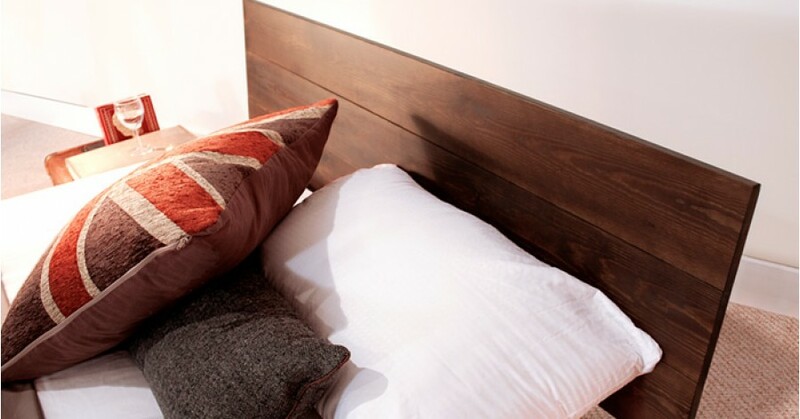 The aim of the wooden Floating Bed frame is to bring an element of uniqueness and modern style to your bedroom. 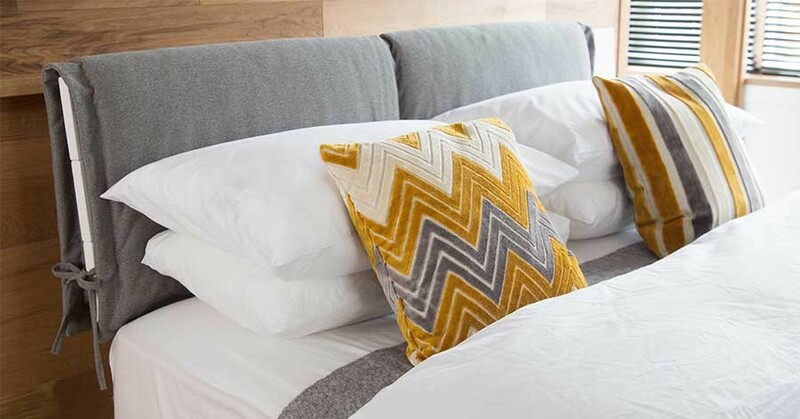 The original design is renowned for its popular contemporary look and style, and this unique bed brings a fresh, unique and sophisticated style that appeals to any bedroom. The design was created for a stylish and modern new type of bed that kept in theme with the rest of handmade wooden bed range. The floating bed frame is a combination of ideal efficiency and creativity. We wanted to provide space for underbed storage, but not a bed that would take away from the room you have. In that way, it’s similar to our space saver range of wooden bed frames. However, it’s reversed, as the new design enables the mattress to sit over the edge of the frame and be supported by its inset legs. The wooden Floating Bed frame features an inset bed frame to allow the mattress to effectively float above the bedroom floor. This stunning design is not only attractive but importantly only takes up little of your valuable space. With no legs at the foot of the bed, it is also practical and ensures you won’t ever catch your feet whilst moving around the bedroom. In addition to the base and main framework being set back from the perimeter, the wooden Floating Bed frame also features a sophisticated slanted headboard made from solid wood in keeping with the overall design and provides any other required support that you may need after a long day. It’s perfect for sitting against to read, and provides the perfect base to use cushions and pillows to help you get as comfortable as you want. At Get Laid Beds, we designed the Floating Bed with comfort and creativity forming the base value for our customers. We design our beds with our customers in mind and we aim to provide the best quality wooden beds for you. 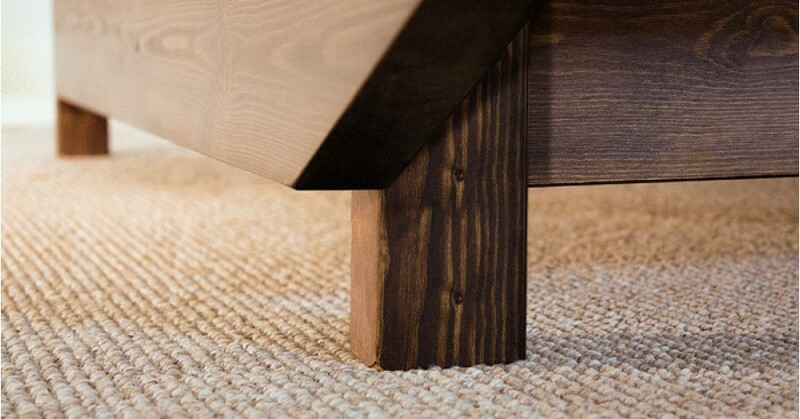 With many years of experience in the wooden bed making industry, here at Get Laid Beds we use many traditional manufacturing techniques such as the half lap and Mortise and Tenon joints. These tried-and-tested techniques provide incredible strength and durability to our bed frames, to make sure your bed will last you for years to come. We are proud to provide all our bed frames with an 11 year guarantee. If you have any other requirements or would like to make any changes to your bed frame we will happily manufacture a wooden bed to suit you and your bedroom requirements. Once purchased your wooden bed order will be sent to our workshops to be handmade ready for delivery on your chosen date. All our beds come flat packed ready for home assembly. Furthermore, because each and every rail and leg has been manufactured to slide into one another with ease and efficiency, you’ll have your luxury handmade wooden bed frame together in next to no time. 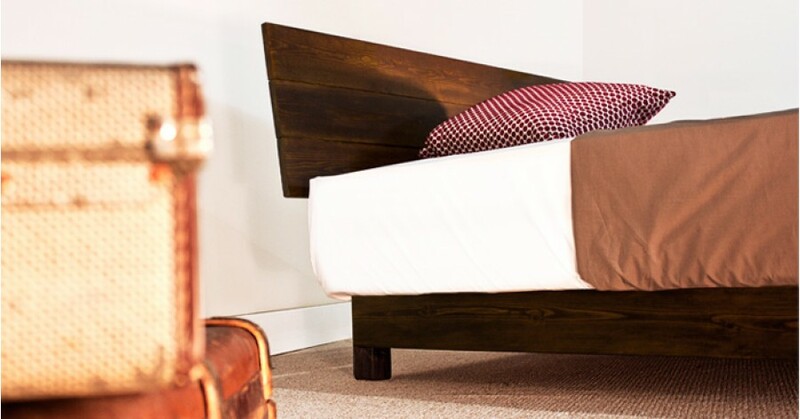 The handmade Floating Bed is part of our unique floating bed range, which includes the stylishly Floating Platform Bed, Low Shoreditch and Low Shoreditch Platform handmade bed frames. These beds make up our floating bed range and the design process has took inspiration from other popular models, including the luxurious London Bed. 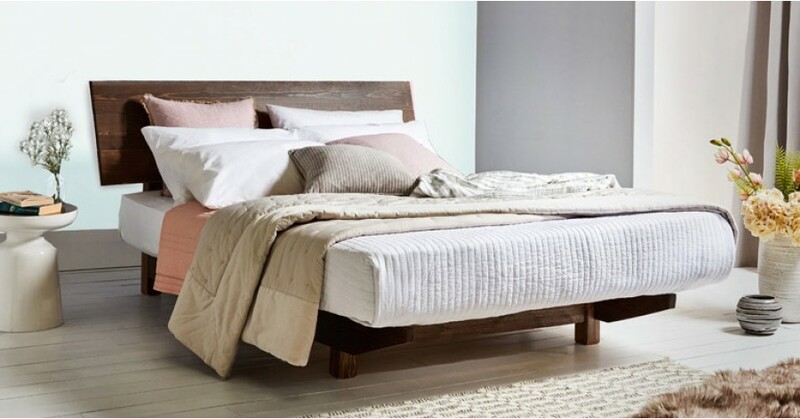 The wooden Floating Bed frame shares the same modern style of a slanted headboard as the stunning Chelsea and Kensington handmade bed frames. Please note mattress, bedding and underbed storage boxes are not included with the bed frame. These can be purchased separately. Please be aware that our Floating style bed frames are designed in a way to ensure the end of the slats can not be seen like in the images above. For this reason you will be sent a set of slats that are in similar width to the bed frame but one size smaller. Please note the sizing chart shows the width sizes of the bed frame with the mattress in place. The mattress is designed to exceed and overhang the slats width by around 3 inches to give the floating effect whilst maintaining stability.